Are we teaching our most successful students for a lifetime of avoiding failure? Remember the really clever kids at your school – the ones who always got top marks in tests without really working hard ? What are they doing now? Some have gone on to great things, but it seems to me that many have underachieved in life. If anyone can provide any research evidence I would be massively grateful. A student who scores very highly on intelligence tests and exam scores. They never seem to put much effort into their work and give you what you want but no more. Homework is always done, but there is no extension of it or alternative theories. They quite often appear bored, but do not exhibit behaviour problems or going off task. Little initiative is shown, nor much or any passion. They go through the motions and pass all standard tests, but are completely thrown by a question which has a different style to those they are used to. They do not enjoy open tasks that lack structure or activities that take them out of their comfort zone. They are only interested in their performance, not comments on how to improve it. These are the students that to me are often overlooked as they are victims of their own success. They are failed by the standardised test system that only measures performance. These students are masters of decoding exam papers, often with little or no understanding they use a system of learned processes to answer questions often without any deep thought needed to do so. These students can be fabulously qualified, but poorly educated. They are good for carrying out procedures that they have been taught to do when told to do it. As they have strong knowledge base and high levels of qualifications they have always been employable. This however may change in a world that values more what you can do than what you know. These students often lack autonomy and creativity. They have never needed to build resilience as they have very rarely failed. When they do fail they are stuck without strategies. Their sense of success has been based on their perception of their cleverness that has been constantly verified by the system, rather than by how hard they have worked to earn that success. When they do hit a hurdle they see this as a failure in their intellect rather than something they can take control of. Failure is not seen as a learning experience, but something to be avoided at all costs and they are often very risk averse. We send these children into the world as very academically successful , but very dependent adults incapable of doing much on their own. What can we do with these students? One of the main issues is persuading them that they need to change. They are successes on every measure that we use to assess them with. If we have an obligation to really equip them for the future and teach the student, not just the material then we have to try. One of the problems is that these students often have deeply entrenched habits that focus on performance supported by parents and schools. Their sense of self depends on being seen to be clever and the current system allows them to sustain this. Efforts to get them to push their boundaries are unlikely to be welcome. There’s some brilliant stuff on this in The Spirit Level: Why Equality is Better for Everyone , which explains the notion of ‘social evaluative threat’. This is based on the view that humans are ‘highly vigilant to threats to (our) social esteem’, and that shame is an overpowering emotion. The research shows that, basically, if you really want to make people stressed, anxious and unable to learn, then put them in a situation where they are publicly judged and compared alongside others when undertaking something that it is not in their power to directly influence. Give them something they can’t do, then share their performance alongside that of their peers. We as teachers need to model what we want to see. How can we expect students to deal with potential failure if we ourselves never push ourselves out of our own comfort zones. The problem is as teachers the stakes can also be very high with a single ‘bad’ observation carrying huge ramifications. We need a supportive management to allow us to take risks. 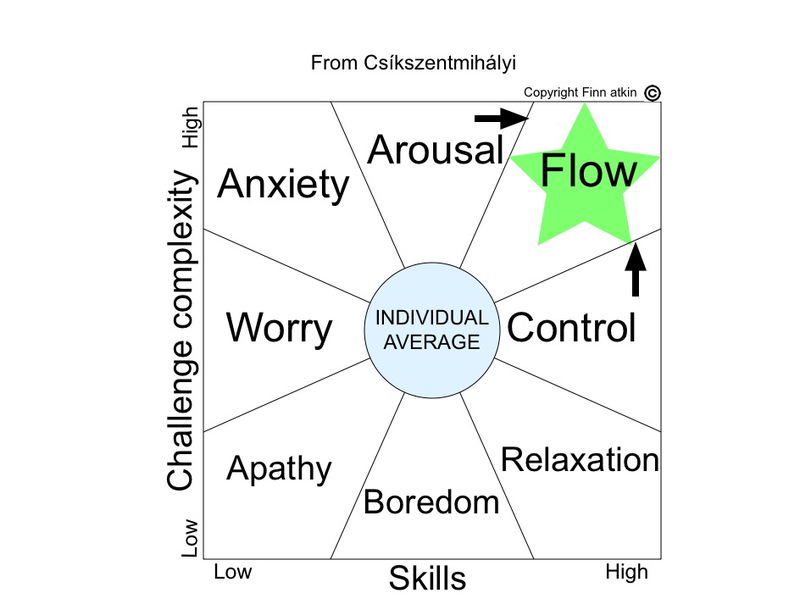 We ideally want our students to be in a state of ‘Flow’ proposed by the wonderfully named Mihaly Csikszentmihalyi . The state of flow is characterised by a complete absorption in the task at hand, often losing track of time and other stimuli. Flow can only be attained when their is a match between the challenge and the skillset of the students. One of the problems is that students often perceive their skillset to be lower than their true capabilities. In a lot of schools these bright students are often in a state of boredom or relaxation. Simply increasing the task complexity however is more likely to lead to anxiety that is the killer of learning as well as performance and the subsequent letters from parents. Training has to be slow, increase the challenge in small steps with scaffolding for those who need it. Some of our brightest students however reject any support and end up in a state of failure avoidance. Failure avoiders are characterised by blaming external factors (the teacher usually) or circumstances and taking no personal responsibility for a diminishment of performance. The work of Carol Dweck on fixed and growth mindsets would be worth discussing with your students. Those high achievers may have never felt the need for a growth mindset as they are perfectly matched to a performance orientated system where they know the rules and can give the teacher what is required as long as the task is explained clearly to them. Very high achievers often show very little resilience as they are not used to failure and have no strategies to deal with it. So what do we mean by grit? The three act idea from the great Dan Meyer that I have outlined here and the science ideas here are a great way of getting students to set their own targets and learning to move forward in a low risk, but high potential environment. This is a great insight into some highly achieving students. I can picture quite a few I taught and your description fits very well! Particularly, when a grade is not what was by them, or their parents, expected it becomes a catastrophic event in their school life. You’re absolutely right in pointing out the lack of strategy and creativity when a “curved ball” is thrown at them (analogy for exam question different from those practices and, dare I say memorised). Dealing with this type of learner is one of the most difficult things, because it is really hard to prove to them and their parents that a different approach needs to be taken, as their good results “speak for themselves” against anything you can suggest to support them. In short, they will not believe you when you tell them they need to change their strategy for learning. A great blogpost with some really interesting ideas. I’m fascinated by the grit & flow concepts, and @chrishildrew has a brilliant image collection for this – in three pictures! Grit on icy roads makes the traffic flow. Genius! Thanks Stephen – will check out @chrishildrew great when things link together !